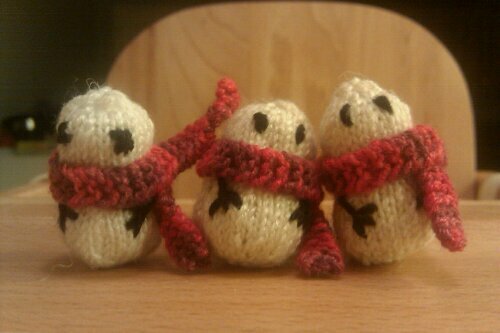 The Tiny Snowman Brigade has appeared on the scene and they are leaving nothing but adorablenss and awwws in their wake. 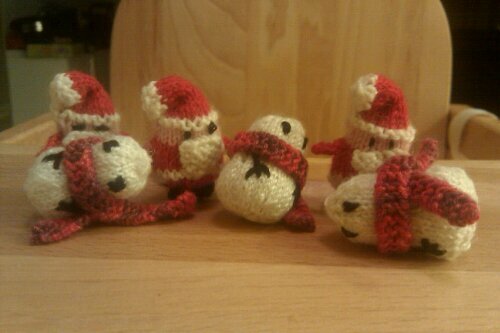 The Tiny Snowmen are knit up using the pattern from Mochimochi Land (where else?). They’re knit up in Panda Silk from Crystal Palace Yarns. Panda Silk doubles as an amazing sock yarn. It’s really nice to work with and gentle on the hands. Don’t worry. The Tiny Snowman Brigade is calling for reenforcements. This entry was posted in FO, Holidays. Bookmark the permalink.